Nociception is the neural processes of encoding and processing noxious stimuli. Nociception refers to a signal arriving at the central nervous system as a result of stimulation of specalised sensory receptors in the peripheral nervous system called nociceptors. Nociceptors are activated by potenitally noxious stimuli,, as such nociception is the physiological process by which body tissues are protected from damage . Nocicpetors can be activated by three types of stimulus within the target tissue - temperature (thermal), mechnical (e.g stretch/strain) and chemical (e.g. pH change as a result of local inflammatory process). Thus , a noxious stimulus can be categorised into one of these three groups. Not every nociceptor responds to each type of the noxious stimuli. The apparent lack of a response to a noxious stimulus may result because of different receptors located on membrane of end terminal (free nerve ending) or the stimulus intensity is insufficient. Usually, the stimulation threshold of a nociceptor is below tissue-damaging intensity. Nociceptors have heterogeneous properties, responding to multiple stimulus modalities (polymodal). However, application of noxious stimulus of one modality may alter the response properties of the nociceptor to other modalities. Also application of particular stimulus for given length of time may induce long-term changes in the response properties of the nociceptor. Injury and inﬂammation decrease the threshold and increase the magnitude of the response for a given stimulus, a phenomenon known as peripheral sensitization. Of particular interest are the heat responsive, but mechanically insensitive unmyelinated afferents that develop mechanical sensitivity only in the setting of injury. 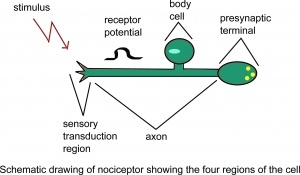 Schematic drawing of nociceptor showing the four regions of the cell. Nociceptors are present in many body tissue but has not been found in articular cartridge, visceral pleura, lung perenhyma, pericardium, brain and cord tissue. Several classes of nociceptors have been described. Some nociceptors respond to noxious cold, noxious heat and high threshold mechanical stimuli as well as a variety of chemical mediators. Nociceptors, although polymodal, can be further divided into two main classes on the basis of response to mechanical stimuli, leading to distinction between mechanically sensitive afferents (MSA) and mechanically insensitive afferents (MIA) defined as afferents that have very high mechanical thresholds or are unresponsive to mechanical stimuli. Nociceptors can by classified by the conduction velocity of their axons or fibres diameter, this is group III and IV ord Aδ and C respectively. Type I Aδ are mechanically sensitive afferents (MSA) that respond with a slowly adapting discharge to strong punctuate pressure. Their also respond to heat and chemical stimuli, and have relatively high heat thresholds (>50C). Type II Aδ nociceptors have lower heat threshold than Type I units, but have very high mechanical thresholds (called mechanically insensitive afferents - MIAs). Activity of this afferent almost certainly mediates the “first” acute pain response to noxious heat. They have been reported in the knee joint, viscera and cornea. Type C unmyelinated afferent fibres that convey poorly localized dull, burning, so called “second” or slow pain are known as group IV. Avarege fibre dimeter is below 2mm and conductive velocity is 2 m/s or less. The unmyelinated C fibres are also heterogeneous. C fiber afferents can be divided into two classes based on their response to mechanical stimuli. Like the myelinated Aδ afferent fibres, most C fibres are polymodal, that is, they include a population that is both mechanically and heat sensitive (CMHs). The response of CMHs is also strongly influenced by the stimulus history. Both fatigue and sensitization are observed. A decrease in the response to heat is also observed following mechanical stimuli applied to the receptive field or electrical stimuli applied to the nerve trunk. This suggests that fatigue in response to a given stimulus modality can be induced by heterologous stimulation, that is, by excitation with a stimulus of a different modality. These are the predominant type of C-fibre nociceptors in mammalian skin. Mechanically insensitive C-fibers (C-MIAs) are either unresponsive to mechanical stimuli or have a very high mechanical threshold. These afferents respond to heat and various noxious chemical stimuli (e.g., capsaicin, histamin) and are often considered to be chemoreceptors. In summury to the above, immediate, well localised, stingy pain sensation is mediated by small diameter mylinated nerve fibres, type Aδ. C fibres madate poorly localized anatomically type of pain, it has an aching and burning character, comes later than the initial first sensation and it is difficult to estimate its strength. Nociceptors respond to certain temperature range and mechanical stimulus. The peripheral end of the axon contains encapsulated proteins called transduction proteins (TRP), which can be activated by a speciﬁc stimulus. The transient receptor potential (TRP) multigene superfamily encodes integral membrane proteins that function as ion channels. The TRP channel family is of interest because several members have been implicated in nociceptor signal transduction. Noxious cold and noxious heat stimuli are detected by Aδ and C fiber nociceptors. The TRP channel family provides a group of molecules equipped to detect thermal changes. The full range of temperatures, from noxious cold to noxious heat, appears to be transduced by the activity in these ion channels. TRPM8 and TRPV3/4 encode cool and warm, respectively, TRPA1 transduces noxious cold and TRPV1/2 sense noxious heat. Some of the thermosensitive TRP channels respond to chemical and mechanical stimuli as well. For example, TRPV1 is essential for transducing the nociceptive by inflammatory, and hypothermic effects of vanilloid compounds and contributes to acute thermal nociception and thermal hyperalgesia following tissue injury. TRPV1 current is potentiated by bradykinin and nerve growth factor via several possible mechanisms and is also activated by protons and capsaicin, the ‘‘hot’’ compound in chili peppers. In contrast to the hyperalgesia following intense noxious stimuli, prolonged exposure to capsaicin can result in a subsequent desensitization. While the discovery of thermosensitive TRP channels has greatly enhanced our understanding of transduction mechanisms of thermal stimuli, findings in animals with selective gene deletions clearly indicate that multiple and yet unknown transduction mechanisms are engaged by thermal stimuli. Injury results in the local release of numerous chemicals from non-neuronal cells (e.g., fibroblasts, mast cells, neutrophils, monocytes, and platelets), as well as from the sensory terminals of primary afferent fibers that mediate or facilitate the inflammatory process. Inflammatory mediators include prostaglandins, leukotrienes, bradykinin, serotonin, histamine, SP, thromboxanes, platelet-activating factor, purines such as adenosine and ATP, protons, and free radicals. Cytokines, such as interleukins and tumor necrosis factor, and neurotrophins, especially NGF, are also generated during inflammation. It is worth to note that most of those chemicals (mainly substances such as bradykinin and prostaglandin E2) are generally considered to not activate nociceptors directly but rather enhance the sensation of pain in response to natural stimuli and other endogenous chemicals by increasing the frequency of action potential firing. Membrane chemical receptors of a nociceptive nerve ending. Activation of nociceptors not only transmits afferent messages to the dorsal horn of the spinal cord but also initiates the process of neurogenic inflammation. Neurogenic inflammation causes release of neurotransmitters, notably substance P and calcitonin gene–related peptide (CGRP), which leads to severe vasodilation, as well as plasma leakage of proteins and fluid from post capillary venules. ATP is the energy-carrying molecule in all cells of the body. It is released from all tissues during trauma and other pathologic changes that are associated with cell death. For this reason, ATP has been considered a general signal substance for tissue trauma and pain. In human microneurographic studies, injection of ATP activated 60% of mechano-responsive and mechano-insensitive C-nociceptive fibers without sensitizing these fibers to mechanical or heat stimuli. ATP activates purinergic P2X3 receptors in nociceptors cousing discharge. ATP is particularly important for muscle pain, because it is present in muscle cells in high concentration. Acid-sensing ion channels (ASICs) constitute a family of receptor molecules that are sensitive to a drop in pH and open at various pH values. The channel proteins react already to small pH changes. This receptor family (for instance ASIC1 and ASIC3) is particularly important for muscle pain, because almost all pathologic changes in muscle are accompanied by a drop in tissue pH, e.g., exhausting exercise, ischemia, and inﬂammation. The cell bodies of nociceptors are located in the dorsal root ganglia (DRG) for the periphery and the trigeminal ganglion for the face. Their axons extend into the peripheral nervous system and terminate in branches creating receptive fields. Free nerve endings terminating in the skin are the machinery for signaling local mechanical, thermal, and chemical changes. The large majority of free nerve endings in the skin are called polymodal nociceptors because they contain multiple receptors and thus respond to various combinations of the above mentioned stimulus. Type I Aδ high-threshold mechano receptors units are densely distributed in hairy and glabrous skin. Receptor molecules that are particularly important for the function of muscle nociceptors are acid-sensing ion channels (ASICs) that open at a low tissue pH, P2X3 receptors that are activated by binding adenosine triphosphate (ATP), and the transient receptor potential receptor subtype 1 (TRPV1) that is sensitive to high temperatures and low pH. In skeletal muscle, the free nerve endings appear to be distributed quite evenly. No difference between the proximal and distal portions of the rat gastrocnemius–soleus muscle was found. However, in the same study the nerve ﬁber density in the peritendineum of the rat calcaneal tendon was found to be several times higher than that in the GS muscle. In contrast, the collagen ﬁber bundles of the tendon tissue proper were almost free of free nerve endings. Innervation of Achilles tendons human is provided by nerves from the surrounding muscles and by small fasciculi from cutaneous nerves but this involves all nerve ending. Free nerve endings are represented inside the tendons, but mainly in peritendinous tissue, are pain receptors. The number and location of all nerve fibers and nerve endings varies according to the function of the tendon, being more represented in the smaller tendons involved in fine movements. Nociceptors in joints are located in the joint capsule, ligaments and proximal tendons, bone, periosteum, articular fat pad and around blood vessels but not in the joint cartilage. High threshold nociceptive afferents terminate primarily in the synovium and periosteum, and normally respond only to movement of the joint beyond the working limits. Following joint damage, two factors combine to alter the mechanical sensitivity of articular nociceptors. First, physical changes (joint effusion and tissue edema) alter the resting and movement-induced forces exerted on the joint tissues, and second, inﬂammatory mediators released within the damaged tissue sensitize articular nociceptive afferents by binding to receptors on the nerve endings. Many nociceptors of the joint respond to innocuous movements but are increasingly activated when movements exceed the physiological working range, whereas other nociceptors are active exclusively during noxious movements. A third group of so-called silent nociceptors are normally inactive and respond only under pathological circumstances such as inﬂammation. Lumbar facet joint capsule has been demonstrated to be richly innervated by nociceptors and proprioceptive fibers. In a normal state, nociceptors such as those seen in the facet joint capsule have a high threshold and would not be expected to discharge unless loads are supraphysiologic. However, in the presence of pathologic joint inflammation, synovitis chemical mediators may sensitize these nociceptors and supraphysiologic levels of stress may no longer be required to stimulate pain. Such inflammatory mediators (substance P, bradykinin, phospholipase A2) have been detected in the facet joint capsule. Nociceptors in intervertebral discs are normally limited to the outer third of the annulus, could be the substrate for discogenic pain when they are expanded over the larger annular area and penetrate further into the degenerated disk along the vasculature and ﬁssures. Those C- and A δ ﬁbers arelikely responsible for transmitting pain responses. The posterior longitudinal ligament and the outer annulus ﬁbrosus layers of intervertebral disc contain plenty of nociceptive ﬁbers. Nerve fibres and nerve endings also occur in the subchondral bone of the zygapophysial joints. They occur in erosion channels extending from the subchondral bone to the articular cartilage. A human study by (Kiter et al., 2010) showed both free and encapsulated nerve endings in the human iliolumbar ligament . Studie by (Hirsch et al., 1963) suggested the presence of ﬁne nerve ﬁbers and complex unencapsulated endings in the supraspinous and intraspinous ligaments. Visceral nociceptors do not respond to cutting or burning injury like their counterparts in the peripheral cutaneous tissue. Instead, they are activated in response to pathological change. Pain producing stimuli in the viscera including traction on the mesentery, inflammation, distension of hollow muscular-walled organs such us gastrointestinal, urinary track, gall bladder and strong contractions of muscle layers surrounding such hollow organs, chemicals irritants or ischaemia in organs such us heart. The distribution of these ﬁbers varies among organs. High-threshold receptors exclusively innervate organs from which pain is the only conscious sensation (i.e., ureter, kidney, lungs, heart), but are relatively few in organs that provide innocuous and noxious sensations (e.g., colon, stomach, and bladder), innervated mostly by low-threshold receptors. Organs, such as the liver, lungs , kidneys, and the pancreas, have few receptors, but the pain from these organs comes mostly from the activation of receptors in the capsules of these organs. Nociceptive stimulation of viscera leads to diffuse pain that is difficult to localize. Afferent nociceptive fibres in viscera are found in association with sympathetic and parasympathetic nerves. Majority of visceral organs are innervated by vagal nerve, but studies do not show clearly wheter or not this nerve is capable to carry nociceptive affren input. However, some studies clearly demonstrate that vagal afferents convey information about high intensity mechanical stimuli to the central nervous system. Number of studies involving human or animals has shown that subjects with spinal cor lesion are able to report pain likely orginationg from visceral organs area. ↑ 3.0 3.1 3.2 3.3 Meyer RA, Ringkamp M, Campbell JN, Raja SN. Peripheral mechanisms of cutaneous nociception. In: McMahon SB, Koltzenburg M, editors. Wall and Melzack’s Textbook of Pain. London: Elsevier; 2006. pp. 3–34. ↑ 12.0 12.1 Meyer RA, Ringkamp M, Campbell JN, Raja SN. Peripheral mechanisms of cutaneous nociception. In: McMahon SB, Koltzenburg M, editors. Wall and Melzack’s Textbook of Pain. London: Elsevier; 2006. pp. 3–34. ↑ 14.0 14.1 Schaible HG, Schmidt RF. Effects of an experimental arthritis on the sensory properties of fine articular afferent units. J Neurophysiol. 1985 Nov;54(5):1109–1122. ↑ Hirsch C, Ingelmark BE, Miller M (1963) The anatomical basis for lowfckLRback pain. Studies on the presence of sensory nerve endings infckLRligamentous, capsular and intervertebral disc structures in thefckLRhuman lumbar spine. Acta Orthop Scand 33:1–17. ↑ Moller, Aage (2014-04-22). Pain, Its Anatomy, Physiology and Treatment. Kindle Edition.